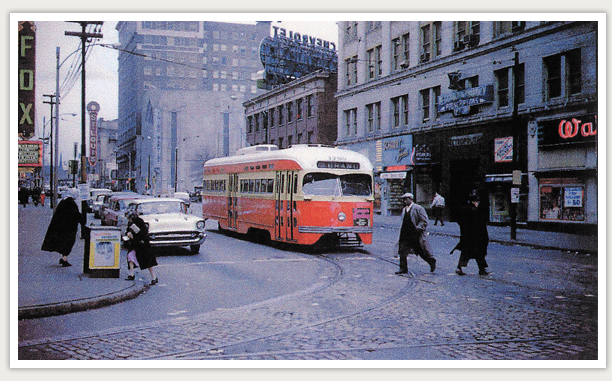 Today’s photo looks northbound on Grand as a #70 streetcar travels south past the Fox Theatre and Olive St. in the 1950s. This is part of the route of this Sunday’s Rock ‘n’ Roll Half Marathon. If you happen to be running the race and are passing by this exact spot, you may notice that these very tracks and road pavers are currently visible through the worn pavement. Looking north at Grand and Olive. 1950s sometime? BOOM! Way to go Justin.